I'd be pleased to hear from you about this but I don't want to get into an argument about whether it is right or wrong. I have family members who are animal rights advocates who have already told me that I shouldn't mention this as a potential use of this Extreme Green Laser. But this Extreme Green Laser is being designed especially to deter sharks without hurting them. We have been gradually reducing the power to find that point where it will chase sharks but not be strong enough to hurt them. Therefore, I will not tell you that this is a good thing to do. I will only point out some facts about sharks and green lasers, keeping in mind that sharks can kill you. I have spent many enjoyable hours in the water with sharks and I have also spent some time with them during which I was not certain I was going to make it back alive. I have seen pictures of what sharks have done to people. 1. 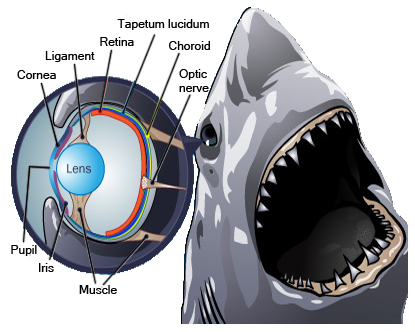 Sharks have eyes very similar to humans, with rods, cones, cornea, iris, pupil, lens, and retina. Scientists believe that sharks see color the same way that we do except, being nocturnal, their eyes are 10 times more light sensitive than ours. 2. Sharks have very developed senses for smell and motion and can sense potential prey from miles away. 3. Sharks have very sharp eyesight and use their eyes to home in on their prey from a distance of about 70 to 100 feet away. 4. "It was once thought that great white attacks on the surface were cases of mistaken identity, but researchers now know that this theory is not likely for a few reasons. Reason one is because white sharks have excellent vision and can probably tell the difference between a human on a surfboard, and a seal. The second reason is this; when a white shark attacks a seal it makes one huge bite, and kills the seal on the spot. When humans are attacked the shark usually takes one small bite and swims off. If the shark thought we were seals then it would do to us what it doses to the seals." 5. If a green laser is extremely dangerous to the human eye, and it is the most easily transmitted color laser under water, and the eyes of a shark are 10 times more sensitive to green light than a human, and a shark looks directly at its prey while approaching it from as far away as 100 feet, do you think a shark would continue to approach an object it was investigating if a green laser was pointed at his eye. 6. Sharks are turned away by electric fields generated by shark protection devices made in Australia because it causes them some discomfort. These devices cost hundreds of dollars and are large and cumbersome. But the shark, like any other animal will avoid discomfort if it is not already fighting or eating. 7. The pain of an Extreme Green Laser should deter any shark from coming too close. 8. Some sharks have second eyelids which they close over their eyes when they are attacking their prey. The great white does not have that but turns its eyes backward during attack. The purpose of this is to protect the eye from getting scratched during the fight. It does not close its eyes while it is approaching, trying to decide if it wants to attack or not. 8. Shark darts that were supposed to inject gas into a shark, or bang sticks that had a shotgun shell or a 45 magnum shell in the end have been used by divers in years past. They are illegal in most places because they are potential weapons, but they had the same drawback. You had to be at most 3 or 4 feet from the shark to use it. And if you did use it, you had a potentially very dangerously injured shark on top of you with your one shot already used. permanently injuring him. And, because its a laser beam, you don't have to be a great marksman. You point it at the shark, you see the bright green dot on him, and you just walk the dot over to his eye. 10. So, I am not saying this is a good or noble thing to do. But I am saying that if this had been invented while I was still diving in areas that had dangerous sharks, I would not have gone in the water without one. Disclaimer: Here's the small print. We don't believe anyone can always always anticipate the actions of wild animals any more than one can anticipate the actions of all people. Therefore, nobody can guarantee what a shark will do every time. The only guaranteed protection against shark attack is to not be in the water with the shark.